This omega oil contains a variety of different seed and plant oils that target different areas of your body. - Argan oil, rosehip seed oil, elderberry seed oil and blackcurrant seed oil. When all this is mixed together you get the clear skin omega oil - tada! There are a few ways of taking this, one way is my adding it to your food the more liquidy ones like soup, pasta - or the other way is to just have a spoonful of it every day and that's what I have been trying out recently! At first I didn't see much of a difference, and felt my skin looked and felt much worse (maybe because it was cleaning up inside) but after a week or so it has really reduced the redness that I wake up to and the dry skin that I get around my face. 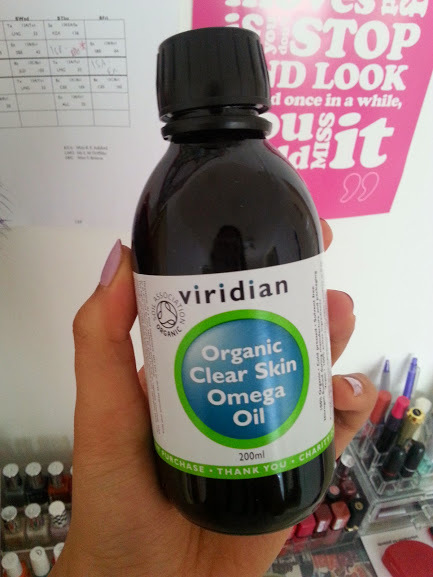 I have fallen in love with this oil, even though its yellow colouring can be quite off putting, all round it is amazing! Buy the oil here at Nutrition Centre!